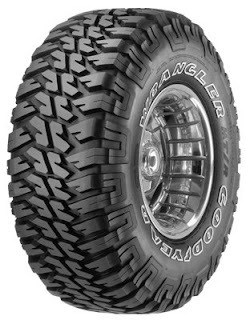 Goodyear has just released it's brand new version of the Wrangler MT/R(maximum traction reinforced)for 2009. The tire will be available in March in 30 different sizes. There are some new larger sizes as well including a 38x14.50R17 and a 42x14.50R17. I have been somewhat of a fan of the MT/R for a while. My last two sets have been the MT/R in large part because of the availability and price, but also because they have a good reputation and I have always had good luck with them(and also, because they do a good job of replacing them when stuff goes wrong). The most obvious difference here is in the tread pattern. The new tread pattern is said to have "advanced mud flow geometry", to help improve self cleaning and traction in mud. The traction blocks are said to have additional biting edges to aid in traction as well. The sidewall treads are ramped and staggered for better traction in rocks and deep mud. Only time will tell of course if these are really improvements. Obviously there is no magic do all tread design, so I'm betting some will like it and some won't. The tread pattern seems to be going a little more towards the all terrain arena. If it's anything like the old MT/R, however, it should do very well in a variety of conditions. Perhaps the biggest improvement to the tire is the addition of kevlar to the sidewall. This is the company's first off-road tire built with kevlar. They claim that the kevlar increase sidewall puncture resistance by 35 percent. This is in addition to the durawall technology of the old MT/R that uses a durawall rubber compound to resist cuts and punctures. In the two sets I have had, I have only had one major sidewall failure. If the kevlar works, it should be a nice improvement. The tires also feature a "rim protector", which basically consists of additional rubber next to the rim to guard the rim from rocks and debris, and a "rim lock" to prevent wheel slip for minimal balancing throughout the life of the tire. 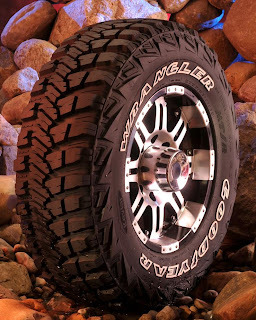 As always, the tread contains an advanced rubber silica to improve traction and an innovative design to make the tire run on, or off road. Have your tires expired? It may sound silly, but aged tires are being sold as new at major retailers across the country, and bad tires are to blame for thousands of automobile accidents and hundreds of injuries and fatalities every year.